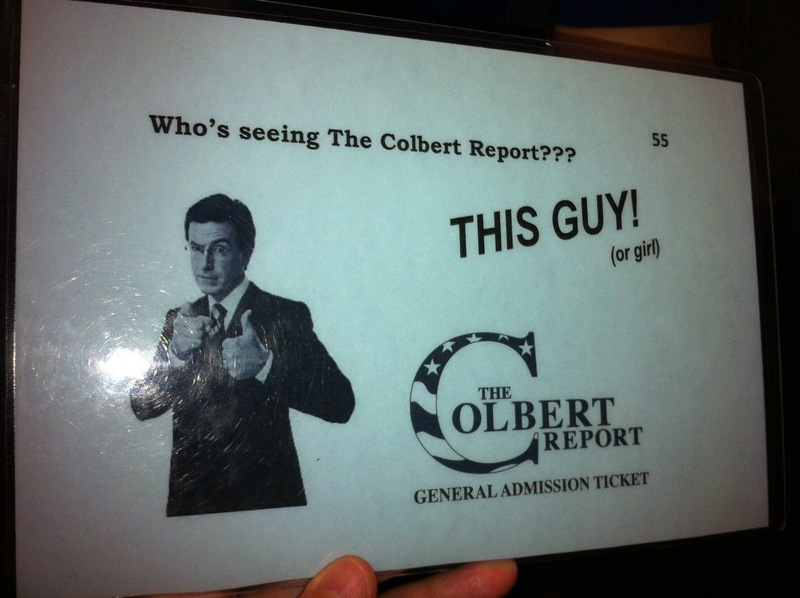 Guess who went to a taping of the Colbert Report? So the Dude and I are back from NYC after a 4-day road trip. It was a really good trip. More details later, but the highlight of that trip? 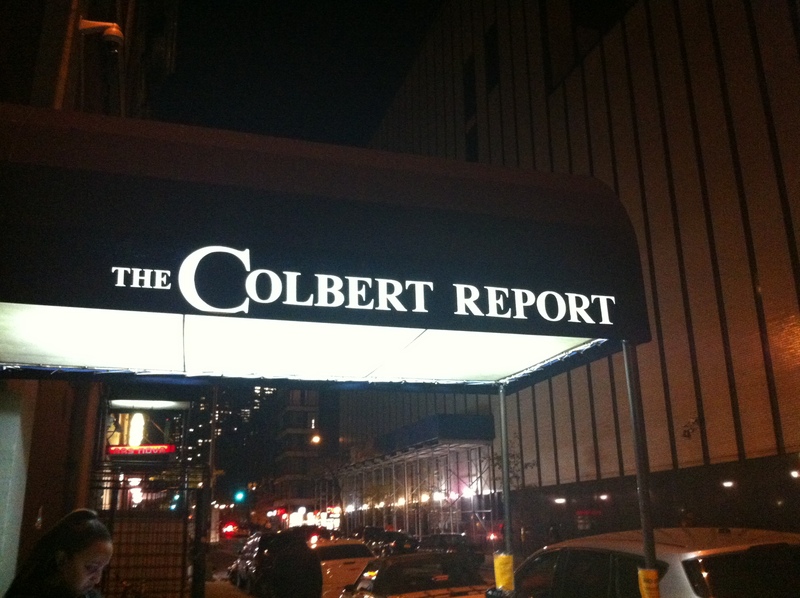 We got to see a taping of the Colbert Report! Leading up to the trip, the Dude was watching the website like a hawk, waiting to see if tickets would become available for Monday, November 18. And finally they did! And we were confirmed for 2 tickets. There are lots of accounts on when to line up, what the process is, and based between The Daily Show and Colbert, we decided that the shorter “processing” time from lining up to getting in would be better for our schedule. The site recommended that we show up no later than quarter to 6, but we ended up making it there at 4:15. A line was already formed with about 30 people in front of us. I left the Dude in line to go find a restroom, and it took quite a while. It shocked me that restaurants don’t have to have a washroom on the premises for customers…and I was going to buy something to use it. Anywho, I got back into line at about 5, and the line continued to grow. At about 5:30, a man came out and told us that we’d be going to be let in shortly, and that we’d have to empty our pockets, have our bags searched, and go through the metal detector. I should mention that the line we were in was in an enclosed tarp with lights and heaters. Since we were early, we got to line up against the wall which was a bonus. So my fears of waiting in the cold and rain (the weather turned out to be great) was for naught. As we were let in, we were each given a blue or red ticket. The blue is for regular folks like me, and the red are for VIP (ie. veterans). The studio is actually quite small, and there really isn’t a bad seat. We were sitting in the left hand section, closer to where the guest is interviewed, so it was fantastic. There were pens with the Colbert Report stamped on them, which I was really excited to get (I know, it’s a pen, but we didn’t see any landmarks on this trip, so it was really my one souvenirs for this trip) Once we were all seated, it was about another 20-25 minutes of waiting and then Comedian Paul came out to warm up the crowd and remind us to laugh and clap loudly. He was actually pretty good as the “starting act”. Instead of having bits, he just interacted with the crowd, which was great. 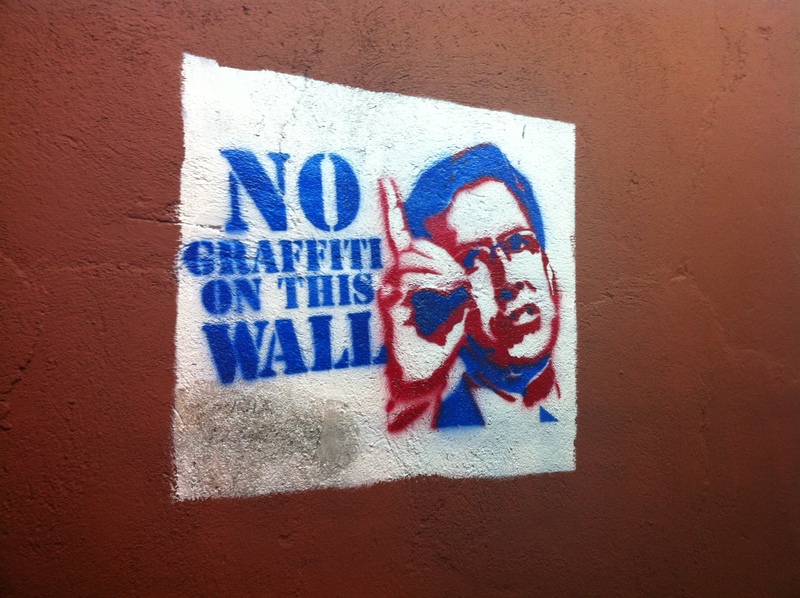 Then Colbert came out and did some Q&A. He was asked which dwarf was his favourite from the Hobbit, and if he name all of the Dwarves (I think he did), he was asked about if he had a cameo in the movie, John Oliver was brought up, just really quick interactions. The taping runs really smoothly, and it really feels like you’re watching it at home on TV. They only did a couple of re-do’s, and during the time for commercial breaks, he goes over notes with the stage manger and some of the writers. The most interesting part was when he had to re-taped a particular word/line, because when we watched the episode on TV (we wanted to see what the final edit looked like!) it was spliced and edited so well, we couldn’t tell that it required another take. The guest that evening was Steve McQueen, who direct “12 Years a Slave”. Overall, it was a heady experience. If you’re a fan of the show, I highly recommend trying to get to a taping if you can spare the time. For us, it lasted about 4 hours all in. I used to really like collecting things. I don’t really know why. Postcards, shotglasses, things like that. But now that I’m older and have moved a few times, and share a house with the Dude, real estate is at a premium, and I no longer have the space to house these things. I’ve been slowly paring down on my belongings over the last 3 years, and just did another stint in the spring. But now that we’re expecting Baby 1, it looks like I have to do it again. And for those of you who think that my minimalist Dude is asking me to do so, he is not. I suppose his non-hoarding ways have rubbed off, and I just don’t feel the need for more STUFF. ESPECIALLY with a baby on the way and all the things that come with that. I just no longer feel attached to so many material things, and have gotten really good at just keeping things that have nostalgic and sentimental value. Which is why when we were in California over the summer, I decided that WE should have a mug collection! For display purposes! I know that there are tons of people out there who don’t like the new ‘You are here’ collection from Starbucks, but I like that they are simple and stackable. (A friend does collect the Global Icon ones and they are really cool). So I’m starting to collect the city mugs for display in our kitchen. Up until yesterday, I only had 5, but now I have 2 more! 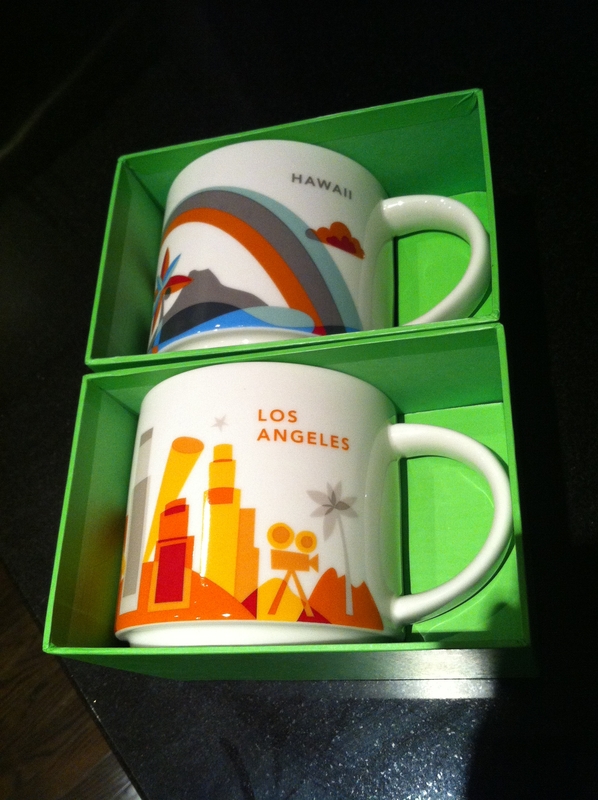 My cousin and her husband just came back from LA and Hawaii for their 10th anniversary, and brought me back more mugs. The collection is growing! My apologies again for the lack of posts. My mind has been elsewhere as the Dude and I discovered we were expecting our first child sometime over the summer. Funny how even though we were trying for a baby, it still feels sudden and unexpected on some level. Due to the whirlwind of work and appointments and trying to plan for the next step, this blog as fallen by the wayside. But hopefully that is a thing of the past. I know I still owe some travel posts, and in the coming weeks, the Dude and I are planning for a last hurrah before we expand by taking a mini-road trip to NYC. We’ve been there before (not together as a couple though), and have already planned to hit up Uniqlo and Muji. A trip for soup from the infamous “Soup Nazi” from Seinfeld was also suggested, as well as some of the wares in Chelsea Market.